For those of you who may be new followers to my blog I would like to introduce you to Cheops. He is a chocolate-silver Ocicat and my baby. Cheops just celebrated his birthday in June and this is how he wanted to spend the day ... lol. Shhhhhh ... just let me sleep a little longer. Look they got me a cake! If you are not familiar with Ocicats they are very interactive cats - always involved in the activities around them. He has learned to open my French doors with the swipe of a paw (not something I encourage). One day I caught him peeking inside the medicine cabinet so now the bathroom door remains closed when we are not home. Cheops has two spontaneous play times - morning and evening and, of course, whenever anyone produces an enticing toy. Cheops has the spirit of a dog in a cat's body and is very sociable. He is of show quality and meets the competition standards; however, I do not show him as he is a house pet. 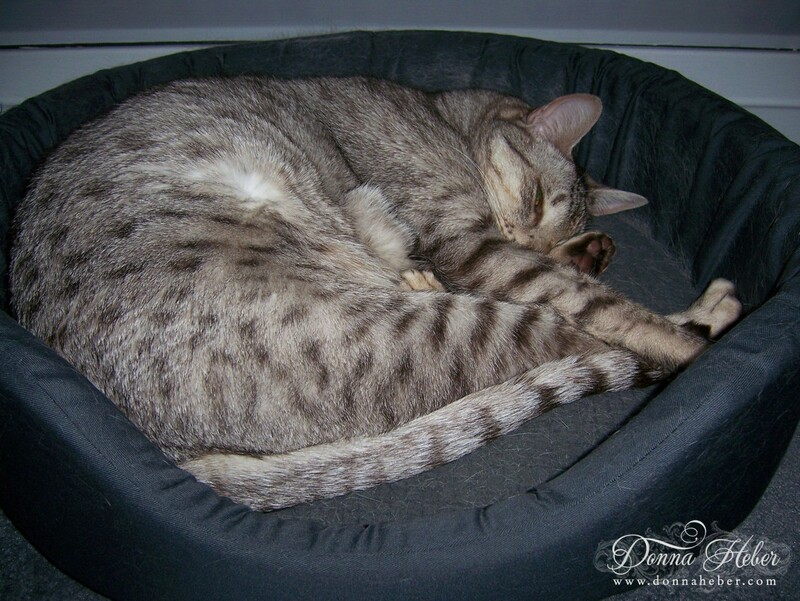 The Ocicat is an agouti spotted cat originating from interbreeding of Abyssinian, Siamese and American Shorthair. It is the only spotted domestic breed selectively bred to emulate the cats of the wild. They come in 12 different colors. He is named after the Pharaoh Khufu also known as Cheops who ruled in the 4th Dynasty (2551 - 2528 B.C.). Cheops' most known undertaking was the Great Pyramid of Egypt. Well, now that you have met Cheops what do you think? If you would like to see more pictures I have a link on my right sidebar. 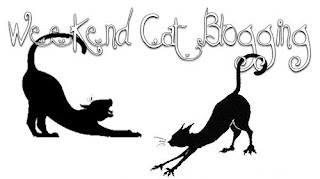 Thank you for stopping to visit Cheops and I. I am joining Weekend Cat Blogging hosted by Amar and Luna at CatSynth. May you have a purrfect day! So sweet! Cheops has gorgeous colorimg ... such a beautiful kitty, Donna! I love cats. We had a Siamese that passed away a few years ago. I miss her terribly. Cheops looks so cute. 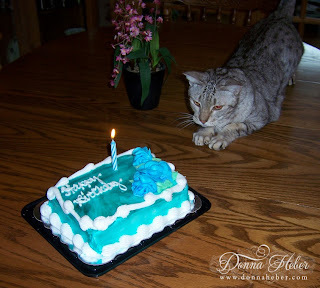 I wonder what he is thinking as he looks at his cake...???? I love the colouring of your Cheops and have always been a cat lover myself. Unfortunately, allergies run on hubby's side of the family and he, and both daughters are allergic to cats. Sweet little cake you made for the birthday celebration, we do spoil our pets, don't we? Cheops is indeed a beauty! We are so happy you have joined Weekend Cat Blogging and look forward to seeing more of Cheops. Cheops is gorgeous! We're not taking part in WCB at the moment because we're kindof busy purring and fussing but you're welcome to visit. We're Malaysian cats. Hello Cheops!! We are very pleased to meet you and look forward to more posts with you! You are a very handsome cat!! Awesome name for an awesome cat! Oh my Cheops is a BEAUTY...love those markings. 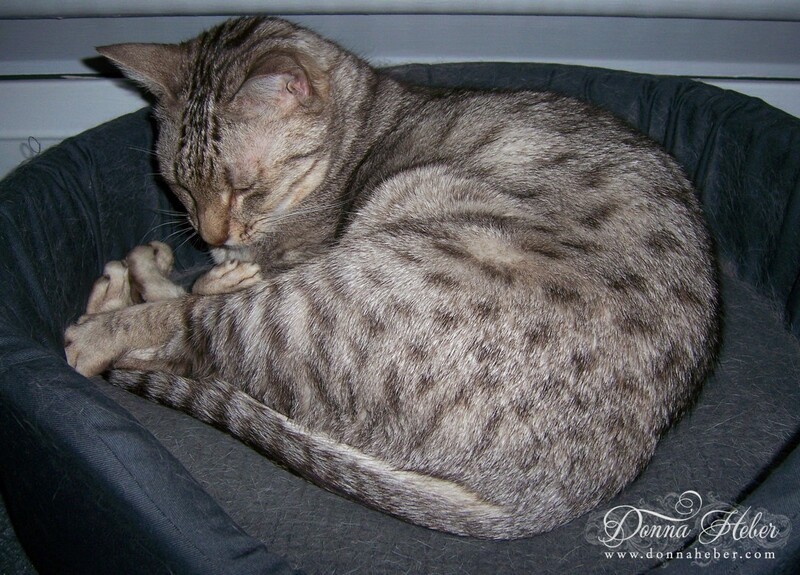 Well isn't that something...I didn't know the origin of Ocicat...how interesting. Love his name ;) I hope you are enjoying some good weather where you are and have a wonderful week! Beautiful cat! My DD just adopted 2 cats from the animal shelter. They are soo sweet! I have never owned cats before-they are so entertaining! Thanks for the introduction to Cheops and his breed . Love the saying at the bottom of the post isn't that so true. Cheops is beautiful! He looks like quite a lover! I have two Tonkinese that are a breed created with the Burmese and Siamese cat. For the most part they look like siamese but a bit less chiseled in the face. The burmese in them makes them more athletic. They don't talk as much as the siamese but I love their faces. Happy Birthday Cheops- you're a handsome guy! I love cats. We have two plus a bunny that thinks he's a cat. Cheops is a handsome fellow and I bet he is king of your castle. Gotta love those pile of feet when he sleeps.